Black paint showed no significant effect on helical radiation shield's superb accuracy. A comparison of two side-by-side shield installations was performed to determine the effects of long-term contamination on the protective properties of the helical radiation shield. One shield was painted flat-black color to simulate extreme dirt buildup and the other was maintained in factory clean condition. Black paint was used to find the maximum limit of solar heating, well above what is possible in real-world applications. Data from both shields was compared at various wind conditions to determine the limit of solar heating for the helical solar radiation shield. For wind conditions above 1 m/s (2.2 mph) the black painted shield showed a negligible average increase which disappeared above 2 m/s (4.4 mph). Below 1m/s the absolute maximum average deviation due to black paint was 0.35°C. We conclude that such small temperature increase due to black paint, when translated to real-world conditions, will result in negligible effect on air temperature measurement accuracy. The limit of temperature error of a helical radiation shield. We painted black one radiation shield. Compared it side-by-side to a clean original factory white shield. 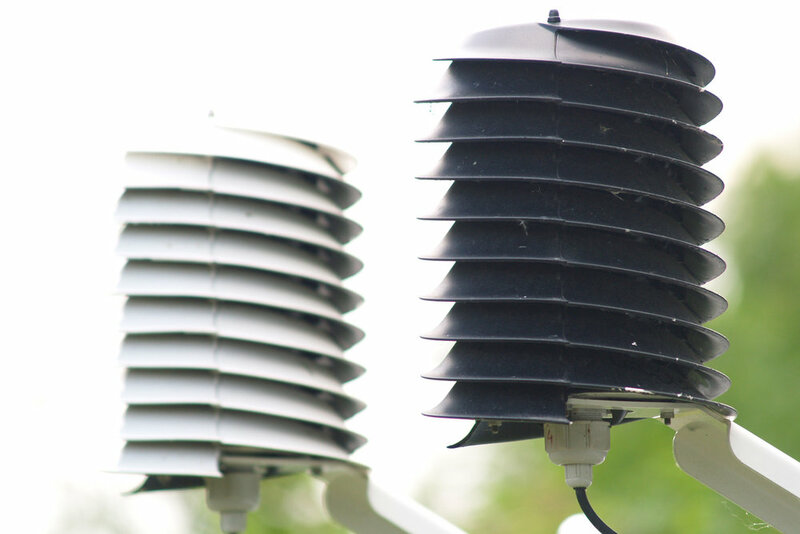 Both shields we mounted side-by-side on a weather station at the same 2 meter height to obtain consistent results. Location with GPS coordinates: latitude 48.1, longitude 17.9. Largest sun induced temperature error occurs in windless conditions when sun is at a moderate elevation angle so that a large area of a radiation shield is exposed to solar heating. We chose to group the results into two categories. Conditions with wind less than 1m/s (2.2mph) to record the largest possible measurement error, conditions 1 to 2 m/s (4.4 mph) and conditions with higher wind. For wind speed above 1 m/s (2.3 mph) and less than 2 m/s, the mean measurement error was 0.31°C for a black painted helical radiation shield with a maximum deviation of 0.43°C. Even heavy dirt, sand or dust in your application will not come close to the extreme black paint in this test. Therefore, for road-side weather stations, smart city sensors or any dirty environment, the MeteoShield -Professional can be considered maintenance free and dirt buildup will not have a measurable effect on its performance. Real-world dirt and dust accumulation will have no measurable effect on temperature accuracy of METEOSHIELD PROFESSIONAL above 1 m/s. Below 1 m/s wind speeds, the mean temperature error was only slightly increased to 0.33°C with a maximum recorded short term deviation of 0.47°C. This was quite unexpected, as below 1 m/s wind speeds, multi-plate radiation shields/screens unusually perform much worse. We attest this uniquely stable temperature measurement to the helical shield design which eliminates the hot-air-bubble effect of traditional designs. Superb temperature stability and resistance to solar radiation error of the helical radiation shield is demonstrated at calm conditions below 1 m/s (2.2 mph). MeteoShield temperature increase due to flat-black paint on the solar radiation shield. Temperature error (increase) is shown in Red and corresponding Wind Speed is shown in Blue. Average error was 0.35°C at an average wind speed of 0.6m/s. Max error < 0.6°C on August 4, 2017. Maximum daily temperature reached 35.75°C. This test was performed purely out of scientific curiosity. It ran for over three months from April to August 2017 in the Northern Hemisphere (Europe) with GPS coordinates of: latitude 48.1, longitude 17.9. An anemometer (MeteoWind) was always present on the site so that effects of wind can be evaluated. On August 4, 2017 the perfect conditions for evaluation finally arrived with with clear skies, strong sun and high temperatures exceeding 30°C with stable wind below 1 m/s. A prototype pyranometer was installed in early June, before the strongest sun irradiation of the summer solstice so that solar radiation could be evaluated. How the spiral vortex flow forms inside helical meteoshield professional. How a helical solar shield protects sensors from dirt, rain and snow. 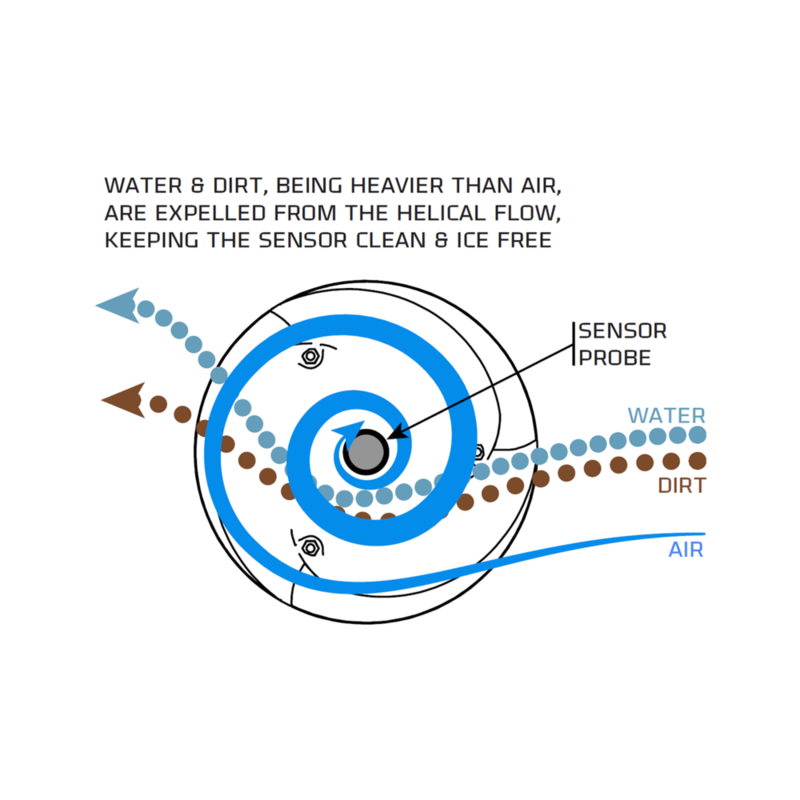 a perspective view of how a helical radiation shield protects internal sensors form rain, snow and dirt to extend sensor life.